XANADU roller-skated its way into the hearts of critics and audiences alike. A hilariously reinvented send-up of the 1980s Olivia Newton-John film flop, this irreverent musical adventure, about following your dreams when others say you shouldn't, spins along to the addictive original hit film score by pop-rock legends Jeff Lynne and John Farrar. XANADU follows the beautiful Greek muse Kira as she visits Venice Beach, CA, in 1980 to induce an uninspired artist, Sonny, to build the first roller disco (yes!). When she accidentally falls in love with him, much to her jealous sister muses' dismay, chaos and fun abound, skate wheels turn and disco balls twirl. The updated script by Douglas Carter Beane takes the plot and dialogue to knee-slapping extremes, while the legendary chart-topping tunes get a musical theatre makeover via a stellar company of performers. 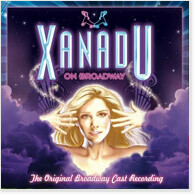 This original Broadway cast recording will keep XANADU in your head, and heart, forever.